Many software teams are good at creating software, but I see many of those same teams still struggle with creating the right value. Discover to Deliver helps with this aspect of software delivery. The agile approach to software development is more than a decade old and by now it is clearly part of the mainstream. However, there is now another movement taking shape, which will change again the way technical people undertake software creation. Organizations are discovering that agile techniques for writing and deploying software still do not fulfill our aspirations for delivering significantly good results. We can rapidly and efficiently write and deliver exactly the working software our customers ask for, but too often the result continues to be mediocre even if the technical quality is quite high. Stakeholders are not delighted. Our customers whom we ask for requirements or stories are seldom both technically savvy and skilled designers, so we end up implementing significantly sub-optimal projects. The new realization is that we need to shift our focus from executing efficient software projects to investing instead in creating really great products. Product innovation requires a broader team that just developers, testers, and perhaps operations. A product focus requires that the product team include people with design skills and business skills as well as the traditional technical skills. People with diverse perspectives need to really understand the problems and opportunities of the people impacted by the software. They need to collaborate together to discover, design, implement, and deliver a truly great product. There is very little in the last decade's agile literature or experience to help product teams do this. Ellen Gottesdiener and Mary Gorman's new book, Discover to Deliver - Agile Product Planning and Analysis is one of the first to offer an approach that can be used by an extended agile product team to discover and deliver a great product. Ellen Gottesdiener's earlier work on collaborative requirements workshops was a great inspiration for me while developing Specification workshops, so I was quite keen on getting hands on her new book. I'm happy to report that Discover to Deliver: Agile Product Planning and Analysis, by Gottesdiener and Mary Gorman, is likely to be as useful and influential as their previous work. Discover to Deliver is their take on many modern trends in software product management and planning. The key idea in the book is that there is a tight coupling between learning about what is needed and delivering software, each activity informing the other. This is similar to what Dan North talks about in deliberate discovery or the ideas of delivering to earn or learn which I present in Impact Mapping. In particular, a big plus for this book is the insistence on delivery scope as a set of hypotheses that have to be proven through delivery, and for demonstrating how examples can be used to clarify ambiguities and discover better requirements. Gottesdiener and Gorman's approach to discovery is a structured conversation involving three different time-line views (now, pre-view and big-picture), three value consideration perspectives (customer, technology, business) and seven product dimensions (user, interface, action, data, control, environment and quality). Through different combinations of those aspects, they present how product partners (delivery and business) can collaborate on creating a product vision, delivery roadmaps and implementation requirements. The ideas of product partnerships and structured conversations will be familiar to anyone following design thinking, in particular the co-development and divergent and convergent thinking ideas. The authors add another dimension - confirmation - to divergent/convergent thinking, which nicely completes the whole picture. Answering the key questions to describe the product from those many dimensions is intended to provide a holistic, comprehensive understanding of different customer and stakeholder needs. If this sounds too complex, don't worry. The book provides several checklists and a nice visual template similar to the one in Business Model Generation, which will come in very handy to facilitate discussions. A table of "Focus Questions" is another important checklist that many readers will want to keep close at all times. The first section of the book presents an imaginary case study through prose and dialogue, in which the authors demonstrate three important conversation types and show artefacts that are produced during those sessions. Lots of nice examples of personas, stories and role maps will be particularly useful to people who are aware of the key agile analysis and delivery practices but have not used them yet, or not used them correctly. I would have preferred to read a real story, instead of an imaginary one, but the examples are developed enough to make the concepts more concrete. The second, third and fourth sections go into details of the most important concepts from the authors' process, including the three aspects of product partnership, seven key product dimensions and the elements of the structured conversation. With plenty of examples and checklists to spark discussion, these parts of the book present the process of discovery at a relatively high level, with references to additional tools to explore. The fifth part of the book is a relatively short introduction into how the overall discovery process fits into Scrum, Kanban, potentially Waterfall and how it can be adjusted for different types of products, including commercial software and regulated environments. The sixth part is a quick high level overview of additional tools and techniques that fit into the discovery process, from user stories over use cases to value stream maps and given-when-then acceptance criteria. Each tool is presented with an example related to the imaginary company from the case study, and a high-level explanation of how it would fit into the overall process and when it would be useful. The book is reasonably short, only around 300 pages. Apart from the dialogue in the first part that, given my attention span, I had to force myself to read carefully, I found the book easy to read. I was able to go through the entire work on a not particularly long flight. It's obvious that there was a lot of love put into the visual design of the book, with lots of useful illustrations. A journey map, similar to public bus route maps, at the top of every page helps with navigation but is also a great tool for setting the expectations. This book will be most useful to people who already practice agile delivery and want to improve their product planning or analysis techniques. The case study dives in straight into the gist of the matter, so it might be hard to follow for those completely new to the topic. The last two sections of the book, related to process adjustment and additional tools, are at a very high level, with enough information to put things into perspective and inspire further research, but not enough information to fully adopt or use any of the techniques. I think that the trade-off is good, as there are plenty other books on basic aspects of agile product management, and we need more of advanced level material on these topics. Discover to Deliver will be an invaluable reference for anyone with a product owner or analyst role in agile and lean projects in the near future. You'll want to keep this book close as a reference and use it to pull out questions to facilitate conversations with your product partners. Discover to Deliver is the book business analysts transitioning to or using agile methods have been waiting for. In clear, simple language, with the support of beautiful graphics, it walks you through the process of building a product in collaboration with customers, business users, and developers. It provides analysts with a powerful framework for collaboratively discovering the right requirements. Most of all, the comprehensive case study and examples will give readers insight into not only what to do, but how to do it well. Must read for all software teams that want to build awesome products. There are many aspects of this book that I absolutely love. To start with, the case study at the beginning sets the tone for how a team can communicate clearly and effectively. Throughout the story, the team members challenge each other which in an of itself is a great learning tool for readers of this book. To me, the most important parts of the book are how it shows you how to figure out where you are in the project with the "Big -> Pre -> Now" View which is extremely helpful in grounding structured conversations. Next is the 7 Product Dimensions Options board. It's a great way to visualize the project and I can see how it could be easily adapted to any project's unique needs. Overall, the language used, visuals and concepts, along with fantastic typeface and structure, make this an absolute must read for all software teams. This book describes precisely what delivering a 'quality' product is all about. One of the pleasures of having worked in the computer field for such a long time has been watching new ideas emerge and initially cause confusion and controversy, before eventually becoming understood, accepted, and practiced widely. But the process can take a long time: even now, more than 10 years after the publication of the Agile Manifesto, it's surprising to see how many IT project teams are still using the waterfall development approach. One reason for the slow acceptance is that many new ideas are initially presented as abstract concepts - abstractions that sound good, but are difficult to put into practice. In the case of agile development, for example, my colleagues and I began preaching the benefits of iterative, incremental development as early as the mid-1970s; but we didn't have a book like Discover to Deliver that would provide project teams with detailed guidelines and essential practices that they could use every day in the real world. The authors of this wonderful new book, Ellen Gottesdiener and Mary Gorman, may well have had the same abstract ideas back in the mid-1970s - though I will diplomatically suggest that they couldn't possibly be as ancient as me. In any case, it's evident that they've implemented their ideas, with hands-on project work and consulting assistance, rather than just lecturing and writing about them. They've observed the collaboration that takes place between stakeholders, product champions, partners, and advisors in successful projects, and they've organized and documented those observations in a form that virtually any project team member will recognize as both common sense, and also essential to the project's success. 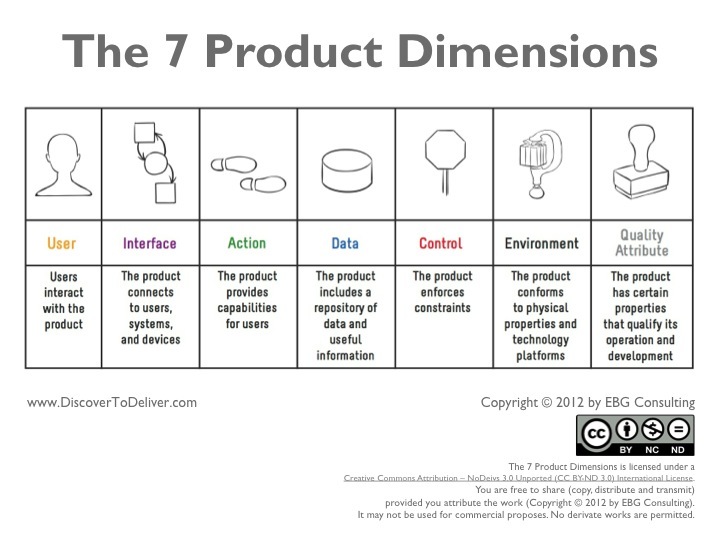 One of the things I like best about Discover to Deliver is the authors' straightforward description of the seven "product dimensions" that provide a holistic understanding of the product that the team will develop: the user, interface, action, data, control, environment, and quality attribute. An entire section of the book is devoted to a detailed explanation of these seven dimensions, and another section is devoted to an equally detailed explanation of how the project team and its collaborator/partners go about the process of exploring, evaluating, and confirming the various product options. There are many different ways of presenting ideas like the ones in this book, and Gottesdiener and Gorman have chosen a way that I happen to like very much: a case study, which allows the reader to see and learn about something tangible and potentially "real," rather than just arcane abstractions. Their case study involves the development of new window-cleaning services for a fictitious company called Squeeky Kleen (referred to throughout the book as SK) - and while some readers might complain that SK isn't precisely like their company, or the kind of systems they build, it's broad enough and pragmatic enough that one can easily see how it can be applied to a wide range of other situations. And the case study (and associated development concepts) is not only presented in a straightforward textual fashion, it's augmented with an equally straightforward visual language that can not only be understood by technical IT folks, but also by the wide variety of people from different roles, organizational boundaries, and cultures who find themselves working side-by-side on today's mission-critical projects. Discover to Deliver is not a primer on agile or lean development approaches, nor is it a book about the fundamentals of project management or product development; thus, it's not intended for neophytes or absolute beginners in the IT profession. But anyone with a few years of real-world experience and with prior exposure to agile development, project and product management, business analysis and application development will find this book practical and useful -- including business people with a few years of experiencing interacting with IT systems and IT professionals. I won't suggest that you'll be able to absorb Discover to Deliver in a single reading; it is, after all, nearly 300 pages long, and it's not a Harry Potter novel. But I will suggest that it will join a relatively small group of books on your bookshelf, to which you return, over and over again, for good advice on tackling today's development issues. Perhaps more important, I think Gottesdiener and Gorman's book will serve as the "project Bible" that many diverse project/product teams will use to create a common, shared set of ideas, strategies, values, and practices for their work. If it succeeds in that fashion, as I believe it will, Discover to Deliver may well become one of the most important new business/technical books we've seen in a long, long time. Here's a book that combines the agile thinking with a structured way to extract those elusive requirements and needs we need, in order to deliver true business value. All through the book, you can really sense the vast experience of business analysis that Gottesdiener and Gorman have. They take a holistic view of what has to be considered in the development of a product and the importance of partnership - in development, end users and client. I also appreciate the authors' emphasis of the continual learning process and the focus of planning in all three aspects (now-view, pre-view and big-view) in order for the team members to really understand what we are moving toward. In this area, the authors also stress the significance of validation and how we must let that action lead us through the development process. As readers, we get resolute guidelines in what we need to keep in mind when analyzing a product needs (the seven dimensions). Furthermore, Gottesdiener and Gorman underlines how much richer and understandable the documentation can be when we use different documentation models (e.g. prototypes, scenarios, diagrams and user stories). This book can be immediately used in the real world. Highly recommended! This book, Discover to Deliver, by two of the thought leaders in business analysis, is an essential reference for any BA working with Agile approaches. Ellen and Mary present a complex subject with a clear and engaging style and provide a wide range of examples to show you how their recommendations can be applied in practice. I've heard from many IIBA members that they have found themselves challenged in adapting to Agile methods and I'm delighted that a resource of this caliber is finally available to the business analysis community. When I was reading Ellen Gottesdiener and Mary Gorman's Discover to Deliver - Agile Product Planning and Analysis, I had my highlighter, pencil and my sticky notes ready and I'm happy to say that I have many little pink stickers pulling me back to areas of interest, along with the notes I made as I was going through it. My library is filled with paperbacks (I'm not a fan electronic reference books), but I think this is one of my favourites as far as the feel of the book and the turning of pages. There are so many very positive things about the book in general - besides the content. I liked the graphics at the top of the page so you could constantly see where you were in relation to the rest of the book. I also liked the use of pictures to continually remind us of what we were focusing on. There is a lot of theory for people who are new to analysis, but Ellen and Mary use case studies and practical examples to demonstrate exactly what they mean. For example, their example of a structured conversation walks through a very typical team conversation showing how complex a very "simple" story can be if the right questions are asked. They examine ways to look at the feature to bring out the important factors the team needs to consider. Many of the tools and techniques (summarized into one great section) should feel familiar to testers since they are many of the same ones we use to create tests. This book demonstrates how testers can add value by using those tools early to prevent defects or missing requirements. If testers bring their testing mindset to the early structured conversations that Ellen and Mary describe, the results can be amazing. Discover to Deliver is not focused on one delivery method but how to adapt to the one you are using. So much depends on your context and perspective, and I think Ellen and Mary have done a tremendous job of giving techniques and tips on how to adapt to the one you are in. I recommend this book to all team members to read. I’m sure each one will get something different out of it. I've known Ellen Gottesdiener's and Mary Gorman's work for many years. I've known it to be solid, comprehensive, well-thought-out and very well-received by their clients and audiences. The same is true of their writings. In particular, Ellen's Requirements by Collaboration has been very successful and her Software Requirements Memory Jogger has become a must-have. But (and usually a "but" suggests that something negative will follow, but not this time...) I believe that in this book, Discover to Deliver, Ellen and Mary have outdone themselves. This book is a powerhouse. From a detailed case study, to an overview of critical concepts, to a discussion of seven key product dimensions, to the structured conversation that guides the communication between product developers and customers, this book lays it all out. In addition, the book provides detailed information on how to adapt the ideas to your own organization and offers an extensive list of tools and techniques to choose from. Throughout, it offers examples, sample conversations, charts that are actually readable, lists of roles and responsibilities, and so much more. And the case study, which flows through the book, serves as an ongoing mega-example to illustrate all the key points. Especially important, this book uses a visual style that provides structure for the content, keeps you on track as to where you are in the process, and makes the information highly accessible. These visuals are creative! And they appear throughout the book, not just as an occasional distraction from the text. There's barely a page without a visual and very few pages without examples. This book derives from Ellen's and Mary's extensive experience in organizations of all kinds - and it shows. The book specifically targets Agile product planning and development and will be a goldmine in that context. But (there's that "but" again...) I believe it can be valuable in all kinds of projects in which schedules, budgets, and relationships matter, and getting it right counts. Which is to say, all of them! There are so many things I like about this book. I love books anyway and enjoy the prospect of spending a little time gleaning wisdom from experienced experts like Ellen and Mary. The book has a nice "heft" and I like the way the pages feel. The opening catches my attention -- an unusual way of explaining the book to me instead of an ordinary table of contents -- a visual graphic that tells me the story of the book and offers tempting inroads, choices about where to enter the tale. The book opens with an adventure -- the account of a team struggling with the same kind of issues all teams face. This book is about planning and analysis -- key activities for any development group. The reader is a fly on the wall and sees how the concepts that Ellen and Mary are introducing are put into practice. And, all the while, that nice graphic is at the top of the page, reminding me of my place in the book, what I've already seen, and what's yet to come, so I won't get lost along the way. I try jumping ahead and find that, for the most part, I can make sense of topics that are presented further on, because the explanations are so clear and the examples, the page layout, the sketches all support the flow. My favorite section? Tools and Techniques, hands down! Over the years I have learned so many strategies from Ellen at the retrospectives facilitators' gatherings. I was definitely taking notes as I perused this and was happy to note that more examples can be found at www.DiscoverToDeliver.com. And I really, really like this statement on page 187: "The discovery practices in this book are helpful no matter which delivery method you are using: traditional (waterfall), timebox (Scrum), or flow (Kanban). Adapt your structured conversations based on your delivery method." Wondrous! I love seeing what's good about a variety of approaches -- these discovery practices are a nice common watering hole where all developers can meet and agree, for the moment, to share in peace. I know you're going to enjoy this book and learn a lot! The art of product planning is to uncover what you need to build to the best product you can with the resources available to you - it's a balancing act. What makes this challenging is that essential requirements are often missed along the way. We'd like to avoid making major changes to our products late in the day and risk compromising the quality and integrity of our product. Taking an agile approach enables us to deliver incrementally, realizing value at the earliest opportunity. An agile approach also enables us learn from each delivery and use this feedback to make a better product. As we practice frequent delivery, we also gain vital experience in our team capability to deliver - helping out team balance what's desired against what's realistically possible. Where many teams struggle in applying an Agile approach to product planning is that traditional requirements analysis techniques don't seem to apply. Agile teams evolve requirements through meetings and aim to keep documentation to a minimum. Applying a lightweight approach looks easy but requires different skills. I often see teams in suffering long unstructured meetings trying to work with requirements written up in ways that don't help the team figure out what to build. Discover to Deliver is a wonderful guide for teams who are new to an Agile approach that gives you practical tools to enrich your product backlog as a team. This book will help you discover dimensions of requirements that are not easily represented as user stories and at risk of being overlooked. The authors are experienced facilitators and unlike many books that focus on artefacts, they get to the heart of how you evolve them. You will learn how to bring structure to your conversations with tips on practical details, such as what questions to ask and how to document what you've learned. What I like about this book is how carefully it has been put together making the contents easy to consume, each concept is illustrated with sketches and examples. The authors have clearly applied their own advice in creating a book that is pared down to valuable techniques and easy to navigate using the progress bar along the top of each page. As an agile coach this book is great to give to new product owners. If they already have experience with traditional requirements analysis, they will find within the pages how these can be adapted for agile teams. But if they're new to requirements analysis and trying to fit everything into user stories, this book will open their eyes to dimensions of the product that they may have been struggling to express to the team. During the past twelve years, I've been lucky enough to work on some really rockin' agile development teams. We mastered test-driven development, ATDD or Specification by Example, and delivered solid, robust code supported by automated tests at all levels. Yet, like so many teams I've met, we were plagued with a continual dilemma: the software we delivered was not quite what our customers really wanted. Yes, our Product Owner worked with other stakeholders to present a shared vision for each user story. But too often, we'd endure a lot of "requirements churn" during each iteration. As we showed customers what we were coding, they said, "Oh, sorry, what I really want is this other thing." We'd often start coding without knowing all the business rules. This was incredibly frustrating! Having identified "requirements" as a problem area in retrospective after retrospective, we tried to think of experiments to better understand stakeholders' desires before we started coding. My own teammates started thinking, "Maybe what we need is a business analyst?" We learned about techniques such as Story Mapping, and realized there was a range of skills around understanding what our customers need in their software product. We started learning from Ellen's and Mary's work on Agile BA. We formed a Requirements Community of Practice to experiment with the 7 product dimensions and structured conversations. And now we have Discover to Deliver as a resource! The book lays out useful techniques such as structured conversations, and explores key problem areas such as data. The authors illustrate many useful practices via real-world case studies and examples. Graphics help convey the concepts behind the many useful ideas. This book works for Agile practitioners in a variety of roles, including testers, BAs, programmers, and managers. It presents information in different ways, so that readers with different learning styles can understand. Tools with which readers can experiment are included, such as facilitated workshops and product vision. If you're a BA on an agile team, read this book today. If you work on an agile team that lacks a BA, or has a BA, read this book today. Better yet, have your entire team read this book together, and start experimenting with Agile product planning and analysis practices that will help you delight your customers. If you are looking for insights on how to take a team and deliver value to a customer using Agile methods then consider this book. One of the most challenging aspects of any project is capturing the requirements especially if you are pretty sure the customer isn't all that certain. This book takes you through a process to interactively help to define the needs and deliver them iteratively based on the customer's priorities. I was pleased how the authors were able to take a simple business scenario and apply the concepts. You can envision HOW to apply the concepts yourself with a team that is dedicated to deliver based on interactive sessions with the customer. Oh what fun it is to work with the customer and engage in creating what they really want involving them in the process. Very logical, informative, consistently described, and easy to understand. Other books I have read can tend to have too much jargon and not focus on HOW to really apply the concepts in a real situation. What I love about Discover to Deliver is that the book reads as a constant stream of practical usefulness, built on solid theory and "right-mindedness." As a reader, I was immediately immersed in a case study of a team faced with figuring out how to kick off a software project using an incremental process. I got to see the different stakeholders using structured conversation and brainstorming to identify and agree on the important problems to solve and viable approaches to solving them. As a product manager and former developer from the "many models" school, I thoroughly enjoyed and repeatedly learned from the techniques that Ellen and Mary teach in the book as their anecdotal team jumps back and forth across the requirements-vs-design divide. My copy of the book is sprouting a small forest of page-darts and a few dozen highlighted passages, diagrams, and margin scribbles. I've picked up real insights I am already using in my work. The power this book unlocks, I think, comes from the insights that Ellen and Mary share at the intersection of understanding human nature and team dynamics, appreciating the cadences of incremental development, and leveraging the power of modeling and putting stuff on the walls. They jump right in, teaching valuable approaches practically, and sharing insights about how they work and when they don't. Thanks Ellen and Mary for sharing this with the rest of us! In their new book Discover To Deliver: Agile Product Planning and Analysis, Ellen and Mary deliver an extremely practical and helpful reference for those looking for help planning and analyzing a new product. They successfully combine ideas from several different yet complimentary communities, including agile, lean, product development, business analysis, and lean startup. Through the use of an extended case study that actually walks through the key techniques in a realistic manner, Discover to Deliver provides a quick overview of how the ideas fit together followed by more detailed descriptions of the various techniques. I am influenced by many of the same people that Ellen and Mary mention in the preface, but find this work pulls things together in a very useful way and gives me some thoughts for how to approach my next product discovery adventure. I appreciate how the book does not explain common techniques that have been explained sufficiently in many other places, but instead focuses on how those techniques can work together to address different situations. I really appreciate the structure of the book and the generous use of graphics that makes it very easy to find the particular information I need when I'm in a hurry. Discover to Deliver is a great addition to the bookshelf (real or virtual) of anyone who is looking to improve their products through better discovery. I would like to have been the first person to review Discover to Deliver , however I was too busy actually using the ideas and templates in the book. Sitting down and writing the review took a back seat. In my mind a book that I can be put to immediate use is open for high praise, in case you missed it, Discover to Deliver is one of those kinds of books. Discover to Deliver uses a unique case study layout to illustrate the use of structured conversations within a framework of seven product dimensions to explore, evaluate and confirm product and project requirements. The product dimensions described are: user, interface, action, data, control, environment and quality attributes. The structured conversations that Ellen Gottesdiener and Mary Gorman lay out are conceptually simple, but incredibly powerful. The structured conversations described for each dimensions form a set of interlocking questions that help ensure complete requirements coverage. Quick tip . . . the process that Ellen Gottesdiener and Mary Gorman describes can be used for any type of project – whether functional, agile or a classic waterfall project – even though this book is marketed as a new addition to the agile cannon. The concepts laid out here are just that good. Discover to Deliver provides a platform for taming the requirements beast whether you are building a product, software, processes or hardware. The book uses a graphical way-finding mechanism to take you through sections of the book, which begins with the case study then takes the reader down from the big concepts into a description of the seven dimensions, how to perform the conversations, adapt the results and then a great section on tools and techniques. Discover To Deliver provides a comprehensive yet easy, straight-forward approach to collaborative planning and analysis. True to the core principles of an agile-style approach, the book never over-complicates or over-communicates the topics, yet gives the reader ample knowledge that can be successfully applied to their project. Authors Ellen Gottesdiener and Mary Gorman provide the reader with a well-defined planning framework based on 7 product dimensions, each of which can be viewed through a roadmap lens of Big-View, Pre-View, and Now-View. Colloquial case studies are used liberally throughout the book to illustrate the practical application of their methods. Their conversational teaching style makes for an enjoyable ride through requirements analysis to product delivery. They entrench the reader in not only learning more about the concepts being applied, but how the team in the case study will end up delivering a successful product! Our organization had the privilege of engaging with Mary onsite for a 3-day training seminar, followed by a hands-on workshop where we quickly applied what we learned to one of our high-priority initiatives. Through the seminar and workshop, Mary infused the teachings from the book into our delivery team and we immediately gained positive results. The team continues to apply the 7 Product Dimensions as they facilitate ongoing requirements workshops. The book is always at hand, with its many ear-marks and post-it notes for quick reference. Ellen and Mary are well regarded as practice leaders. They have demonstrated their competency and depth of experience once again through the book Discover To Deliver. This is a must-read for organizations looking for simplicity and guidance in requirements analysis and with planning their next strategic initiative. - This is neither an ideological nor a prescriptive book; it does not preach or push the latest "fad." Rather, this book shares universally useful ideas and is flexible about their use. Even if you don't use classic Lean/Agile, the concepts and practical ideas described in this book will be useful to your practice, no matter what methodology you use. - Discover to Deliver is practical. It opens with a lively, easy-to-read case study that follows a team as it explores product options and decides which to deliver. The case study comes with great illustrations of the various models used to elicit and refine requirements. You feel like you are in the room, learning and growing along with the team. Another section, toward the end of the book, ("Adapt") is devoted to adapting concepts in different circumstances and is full of tips and ideas that will help you reflect on your daily work and improve it. - You don't have to read the whole book to learn. There are several sections that disrobe specific models and techniques, and they allow the book to be used for reference as needed. I highly recommend this useful book. Full disclosure: I reviewed the book prior to publication and provided a few suggestions to the authors. Any analyst who has ever strived to create just enough documentation will find in Discover to Deliver a framework from which to lead the analysis process. This is an important book that provides a new language for us to use when discussing how to create alignment and clarity in our projects and about our products without over-investing in conversations, analysis, or documentation. Easy-to-understand. The book starts by using a dialog style to describe a case study. It is easy to read. The dialog effectively paints a mental picture of how the analysts and the business stakeholders interact. The visuals in the book are priceless. They make the pages of the book attractive and easy to read. They ease the inevitable ‘dullness’ factor of a technical book. Comprehensive. The book covers concepts, methods, people, techniques and tools needed to conduct product planning and analysis. It gives lots of examples. Readers can follow how deliverables are created step-by-step. Practical. I can tell the know-hows described in the book came from many years of practical experience. I appreciate Ellen and Mary keeping the concepts simple. The concepts and techniques provided in the book are important and useful. Ellen and Mary also leave room for readers to research more on topics of interest if required. This book is a must-have for business analysts designing software products. Discover to Deliver provides insight into the thought processes for defining product needs and making implementation/release decisions. Unlike many books, which primarily expose readers to specific planning and analysis techniques, this book changes the learning focus to purposing the techniques to be used together to support product delivery. Discover to Deliver is a critical part of the reinforcement needed to help practitioners increase their mastery of planning and analysis. I picked up a copy of Discover to Deliver: Agile Product Planning and Analysis, at the books-for-sale at a professional conference. I first learned about Ellen Gottesdiener from her 2005 pocket guide, The Software Requirement Memory Jogger. What caught my eye back then was that she called out Business Rules as something to be address when analyzing requirements. At the time, it seemed to me that no one else was paying attention to this critical aspect of business analysis, so she immediately went on my "someone to trust" list. In 2002, she published Requirements by Collaboration: Workshops for Defining Needs. Once again, I found best practices described in straight forward, common sense manner in a well-organized book. Discover to Deliver: Agile Product Planning and Analysis, Ms. Gottesdiener and her co-author Mary Gorman have written the book that every product manager and product-focused business analyst will wish someone had given them years ago. As soon as you open the book and start thumbing through the pages you realize you are holding the secret formula for product success in in your hands. Discover to Deliver refers to a book that came out in 2010, Business Model Generation: A Handbook for Visionaries, Game Changes and Challengers by Alexander Osterwalder and Yves Pineur. The Product Manager and product-focused business analyst need Business Model Generation to set the vision for the product. To realize the vision for the product, you want Discover to Deliver, not in your hip pocket but open on your desk, with lots of colored tabs bristling out of the pages. Here's why. Gottesdiener and Gorman have laid it out so that with each iteration - you are doing "agile" design and development, aren't you? - you develop the courage to ask the hard questions about what you are doing, and, you develop the confidence that you are moving in the right direction. When you need to tune your approach, you know exactly why you doing it and can explain it to management and the development team. Here is a quick summary of what the book will give you. First, the Case Study. Gottesdiener and Gorman have a created a delightful Squeeky Kleen team who are planning and analyzing their company's product needs. The team uses a "7 dimensions" method that unfolds in the subsequent chapters. The Big Concepts chapter illuminates the different aspects of the product, partner, value and plan, and provides a framework for structured conversations that you need to have with different stakeholders. The "7 Dimensions" chapter talks about the user, the interface(s), capabilities for the users, the data, the way that the product enforces constraints, the environment and quality attributes that need to be considered and understood. Like all recipes, it isn't just know what the ingredients; knowing how to mix them determines whether the result is ho-hum or astounding. Business Analysts will be delighted with the Conversation chapter - here's where you learn how to explore, evaluate and confirm the need for product's features. If your project team is leery of running an agile-style product development effort, there's a whole chapter, Adapt, devoted to finding the ways to adapt the practices in the book for your situation. Finally, Gottesdiener and Gorman have generously provided a Tools and Techniques chapter that is loaded with examples. A final note, the book practices what it preaches - the graphics are easy on the eyes and makes the book a pleasure to tuck into your briefcase for the first read as you ride home on the train. Be sure you have plenty of multi-colored stickies with you otherwise you'll end up dog-earing every page of the book. A great book for business analysts working on any type of software delivery project! Discover to Deliver provides a robust framework for thinking about requirements in a nimble yet thorough way. The 7 Product Dimensions is a great tool for thinking about all aspects of your requirements, complete with ways to structure your conversations with stakeholders to elicit information starting from any dimension. While the title suggests this book is for Agile projects, the frameworks, tips, and techniques that Ellen and Mary provide are extremely valuable for any type of software delivery lifecycle. If you conceive, specify, build, or support software product, you should check out Discover to Deliver. he authors, Gottesdiener and Gorman cover a powerful process and framework for structuring the conversations between business, technology, and customers to ensure software products will meet the users and businesses needs and that the most valuable pieces will be delivered first. The book uses a case study as the main vehicle for demonstrating the concepts. Gottesdiener and Gorman catalog seven product dimensions that all product designs must consider: Introduction, User, Interface, Action, Data, Control, Environment, and Quality Attributes. The authors then provide useful detail in how to elicit the requirements for each of the seven product dimensions, including visual tools to facilitate the conversations and get all stakeholders collaborating and aligned. One of my favorite Gottesdiener and Gorman conventions is the three levels of detail used for planning, termed the "Big-View", "Pre-View", and "Now-View", where the Now-View is the most detailed. The final section of the book is an amazing collection of Tools and Techniques, everything from Context Diagrams, writing acceptance tests, personas, value stream mapping, and more. This is a great book for anyone involved in the creation of software systems. What I like about the approach in the book is the planning both in short and long term....who said you couldn't have longer range planning with Agile teams! This book really helps to organize your thoughts and plans around what to capture and when so that you can plan strategically and be successful on delivering value to the users with each sprint. I normally don't comment on books outside my area, but on this I'm going to make an exception to the rule. This book is well worth your time. I can readily tell from reading it that it is based on a great many years of hands-on experience. You don't come by this kind of know-how easily (or painlessly!). A great and trustworthy guide to follow. Here are two other reasons I like the book. (Both should be rules for every writer in our field - no exceptions. And I’m not talking about just books!) First, the writing style and lay-out are very accessible and attractive. That’s no accident - it takes time. (But don't readers deserve it?) Second, it has a complete glossary of terms. Here’s the thing. If a writer isn't willing to take the time to define the terms she uses, why should I take my time to read it? I probably already know what I mean by the words(!). In Discover to Deliver, Ellen Gottesdiener (author The Software Requirements Memory Jogger and Requirements by Collaboration) and Mary Gorman tackle one of the largest problems facing Agile and Scrum software projects, how to successfully integrate the ideas and tools made so popular over the last decade into working, valuable solutions. The book starts with "Section 1 - The Case Study" about the needs of fictional Squeeky Kleen. Ellen and Mary demonstrate the scope of a project and focus on key tenants within Agile, particularly engagement with stakeholders, iterative development, and learning. This approach is successful because they cover many stages of development, a host of useful techniques, and intertwine examples and tools without talking down to readers. "Section 2 - Big Concepts" is an overview of the Discover to Deliver techniques and how the parts fit together with business partners and goals to achieve a successful product. "Section 3 - 7 Dimensions" covers the seven product dimensions: User, Interface, Action, Data, Control, Environment, and Quality Attribute. While not the first model I have seen, Ellen & Mary do a great job covering all the important bases. Frankly, many projects I have been on struggled because one or more of these key areas were missed. Coming into the project and ensuring the right amount of focus on these dimensions will save your project a great deal of time and heartache. "Section 4 - The Structured Conversation" does more than simply tell the reader how to have a conversation. Rather, this section gives advice on how to integrate the 7 Dimensions (Section 3) into productive sessions with a variety of stakeholders (Section 2) and handle the varying levels of detail appropriate for different time periods of the project lifecycle. (Section 2). The last two sections, "Section 5 - Adapting Your Practices" and "Section 6 - Tools and Techniques" give additional information for readers to apply the central message of the book in real world situations. I did not consider this a part of the core teachings of the book, but absolutely vital if you want to move from thinking, "Cool!" to "How do I start using this on Monday?" Stylistically, I found Discover to Deliver to be a refreshing change to traditional books, though this is a personal observation and may not resonate with every reader. The ongoing case study is detailed enough to provide context for how tools are used without being confined to a business novel and the preachiness typically accompanying them. The explanation around the tools was tools was succinct and enough to give readers a chance to see the application, without bogging us down with minutia. The writing is clear and easy to understand. Ellen and Mary avoid all the latest buzz words and insider terms used today. The book itself used a visual "bread crumb" metaphor I found delightful. The graphics, callouts, chapter & section breaks, and even whitespace served to reinforce the message of the book rather than distract the reader. All together, the choices made this a highly approachable book and much better because of their choice. Discover to Deliver does not pretend to cover every situation or go into deep details about how to tackle problems on Agile teams, those topics are covered in depth elsewhere. This book gives a good overview for practitioners who want to integrate bits of knowledge and take their projects and teams to the next level. I heartily recommend Ellen and Mary's book to people who want to understand the big picture of working with Agile and turn it into a success software product. Personal Note: I liked Ellen Gottesdiener's Software Requirements Memory Jogger so much I used to buy the book by the dozen--In total I bought 30 copies to give away. Collaborating with Mary Gorman on this book, she's done it again!